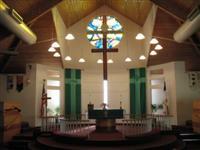 Tree of Life Lutheran Church is a dynamic and growing church dedicated to sharing the peace, love and joy of Jesus Christ. It is an exciting and vibrant ministry with numerous opportunities to get involved. Come meet our Savior, and be fed by His word. We pray that these pages will help you learn more about our ministry and that you would visit us in person soon! Divine Worship - 10:30 AM A liturgical Celebration of Christ worship service with a blend of Contemporary Christian music where the worship, praise and singing are led by a praise team and hymns are sung accompanied by a pipe organ. We welcome Pastor Mark Couser!